Problem: Needed a good home-cooked meal for Sunday, something fun to prep, slow to cook, and with a smell to fill an apartment all afternoon while football is on. 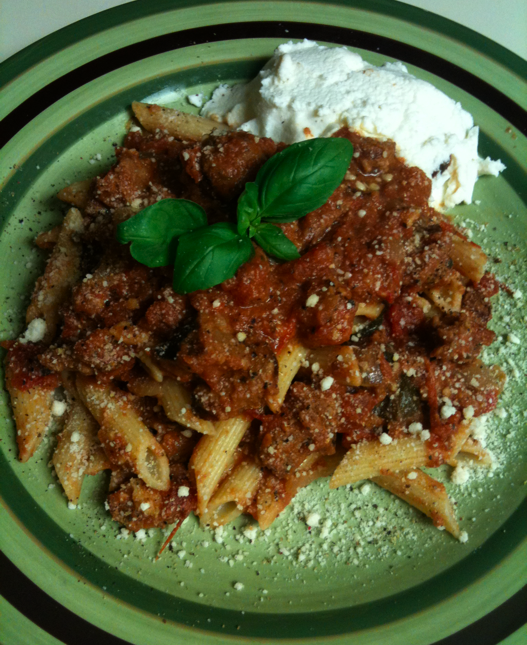 Solution: Fresh tomato sauce with chorizo sausage over penne, with ricotta cheese on the side. Details: Sauteed onions and garlic in olive oil, cooking the sausage over medium heat to brown the sides. Add some fresh basil leaves and chopped fresh tomato, with some spices and black pepper. Add a can of chunky crushed tomatoes for more volume and substance. Let simmer for a few hours. Plate: Mix some of the sauce with the penne, pour some more sauce over the top, garnish with fresh basil leaves, and have the ricotta on the side. Grated cheese and fresh ground black pepper on top. Beverage: 2% milk or glass of red wine. Both incredibly satisfying and pair well with the dish.